Found Leicestershire, UK, 2016 attached to the remains of a large sheet bronze bowl. Cf. discoid mounts from the Lullingstone (Kent) hanging bowl in Farley, J. 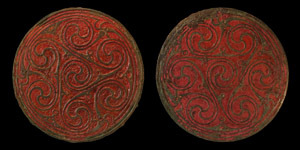 & Hunter, F. Celts Art and Identity London, 2015, item 162.